In this post, I discussed the symbolism behind the sword and it’s use in mystery traditions, magical traditions and it’s connection to air symbolism with the Tarot. Hypatia of Alexandria was the greatest female philosopher of her time and one of the greatest of all time. Little is known about her and she is often overlooked in comparison to her male contemporaries. In a field dominated by men, women are often looked at as inferior. Hypatia however, was so prolific that she was put in charge of the Platonist School in Alexandria around 400 AD. She was a master of mathematics and astronomy and was loyal to the Platonic teachings. She lived a life of virtue and celibacy and was well admired by her peers. Unfortunately, she was murdered by religious zealots who accused her of being evil for having incorporated some pagan religious philosophies into her teaching. Her mystique is mostly lost to antiquity, but she was a maverick in a field dominated by patriarchy. Please check out the linked article below for more information on this beautiful soul and human being. In my latest installment, I would like to do something a little different and tell everyone a story while providing a bit of insight as well. It’s been a little while since I was able to write a new blog, the reason being that my wife and I just had our first child. We opted for a home birth for many reasons, not the least being our distrust of the medical industry. We knew that birth is a natural human function and rarely requires medical intervention. We as a society have certainly have been brainwashed to believe the opposite of this, however. We are told that birth is very risky, difficult, and downright dangerous. I can’t tell you how many times I was asked “what are you going to do if something goes wrong?” as if it was a given that something would go wrong. We trusted in the power of the universe that everything would go fine and it did. The most rewarding and powerful part of the experience was that our daughter was brought into this world in peaceful and comfortable conditions. A peace that I am confident will remain a part of her for life. We contacted a midwife who had been helping mothers birth at home for over 30 years. She was very much in sync with us and our beliefs about birth as well as politics and life in general. She was well aware of the way in which birth is handled by the medical industry who treats it as a medical procedure rather than a natural process, choosing to intervene and do things their way rather than what’s comfortable to the mother, father and baby. Also refusing to let nature work rather than trying to control it. I could go on ad finitum about all of the problems that I have with the American medical industry, but I’ll save that for another time. Needless to say, my wife and I were exstatic the day that her contractions began. The long wait to meet our baby would soon be over! The contractions began in earnest on the evening of June 2nd, consequently the night of the full Strawberry Moon. We called our midwife around 11pm and she was there within an hour. She got everything set up around the house to accommodate us. My wife’s contractions were coming in powerful waves and she was focusing on manifesting the baby. Our midwife told her to focus on finding her “center” to help the process. This was extremely important in the whole birthing process as we were not only trying to make sure that my wife stay focused on staying on task, but also because bringing the baby from one plane of existence to the other is akin to crossing the event horizon. In order to cross over from one plane to another involves finding the center of that existence and crossing over. My goal during labor was to be as supportive as I could and to give encouragement. My wife moved about our tiny house to various locations seeking comfort. I thought to myself that this moving around would not have been a possibility in a hospital setting. She would have been confined to a bed, with various strangers popping in and out of the room. Not a comfortable, peaceful experience for sure! Laboring in the home not only provided comfortable surroundings, but we also knew where everything that we needed was located and were not at the mercy of a doctor or nurse. It was altogether a fabulous experience. An experience that we will never forget. My instincts tell me that a hospital birth would be unforgettable as well, but certain aspects of it we would wish that we could forget. Our beautiful daughter came into this world in our peaceful home without the added duress of the hospital setting. When a last minute minor emergency arose (our baby had some merconium aspiration), our experienced midwife acted quickly and removed the fluid from our babies lungs with the accuracy of a surgeon. Our baby was safe and beautiful, breathing and crying out. I’ve never heard a sweeter sound. An amazing moment in our lives! June 3rd. What a magical day! I know that there are times when Western medicine is a great thing. Injuries, illnesses, dire emergencies, etc. I am truly glad that we as a society have the technology that we do. The fact of the matter though is that the majority of births are safe and can be handled at home. The medical industry has used just about every trick in the book to brainwash the public otherwise, but those who can see through the b.s. should take their birthing rights back and keep their money out of the greedy pockets of the medical industry. This is just one of many ways we can fight the corrupt system. Trust in the universe, God, and your body. Together they will all make great things happen. A peaceful birth will manifest peace within that child that will last a lifetime and beyond! Of all geometric shapes, the spiral is one of the most intriguing and symbolic. It is often used to portray a gateway or portal, or a symbol of cycles. The spiral is a line that starts at a point and curves inward in a circular motion. The line never touches itself as it goes inward or outward depending on how you look at it. It represents an inward journey and the uncertainty of what is ahead. The spiral in motion is at the core of the cosmos and the formation of the world as we know it. It is the essence of life and the generative principle. Freemasonry is the perpetuation of the Mystery Schools that taught the secrets of the universe. Many of those same keys are contained within the rich symbolic content of the Craft, and the spiral is no exception. Operative Masons in antiquity incorporated sacred geometry into their designs. This type of geometry was believed to imbue the edifice with power and connect it with the Divine. These sacred geometric shapes and patterns are not only appealing to the eye, but have a psychological effect on those who view them. The shapes used in Sacred Geometry are the shapes of nature and are contained within all genetic codes. The spiral pattern was present, not only in the decoration of many historic edifices, but was present in their construction as well. Many great cathedrals housed spiral staircases going up to the dome or upper levels of the structure. This staircase was representative of life’s journey and was meant to represent Jacob’s ladder extending from earth to the Heavens. When someone ascends this spiral stair the view of what lies ahead is obscured and the outcome is unknown. Just like the journey of life and the awakening of the soul. 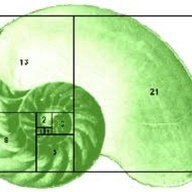 The most obvious representation of the spiral in nature is found in what is know as the Fibonacci Sequence. The sequence was discovered by and named after Leonardo of Pisa, who was know as Fibonacci. The concept was first published in the book Liber Abaci in 1202. However, this concept may have been understood even earlier, as it has been found in early eastern texts and Indian mathematics. The sequence is a mathematical depiction of genetic reproduction in nature. This spiral pattern that the Fibonacci sequence forms is most obvious on the shell of a snail or a nautilus, but is also prominent in the growth patterns of the pineapple and pine cone. In fact, this spiral is everywhere in nature. We learn from new advances in vortex mathematics that the spiral is possibly the creation force of the universe itself. The Toroid, is a spiraling vortex that has no begging or end. It is shaped like a donut and has a hole in the center, or a point of singularity. This vortex is the shape that makes up black holes, and supernovas, and may be the shape of our universe. It is like the womb of our great astral mother who birthed the universe. This toroid shape is thought to be the shape of the vibrations put off by the human body as well. It too is present everywhere in nature and the cosmos. As a black hole may be the passage to another universe, we can see that this spiraling motion may be the key understanding the fingerprint of the Creator. It may also be a clue to the portals between dimensions. 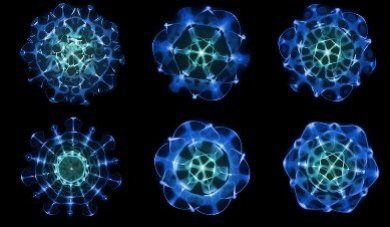 Light and sound waves travel in spiral patterns from their source to their destination. As quantum physics has described, all matter is not solid, but it made up of vibrating particles. At the essence of matter itself is the spiral. The genesis of our cells form in a spiral pattern as each cell is attached to the one in front of it. The Seed of Life, is the sacred geometric representation of this genetic code. It is formed by concentric circles that move outward in a spiraling motion. These interlocking circles form several other important sacred geometric shapes as the Seed of Life takes shape. The cells in the body work in a similar manner when reproducing. Circular, bubble shaped particles reproduce each other in a spiraling motion as the grow to form the matter they are producing. This production is on the micro level, but is mirrored in the macro level as well. As we look deep into space at constellations of stars, we see these same spiraling shapes formed by the galaxies and their contents. The spiral truly is the shape of all matter. It is the shape of our DNA. Our genetic identification code. As above, So Below indeed! So, you may be asking yourself at this point, “what does any of this have to do with Freemasonry?” Aside from the designs of the Operative Masons, no examples have been given. We will now examine Masonic symbolism to see if we can find any spirals. First off, we can start with the most obvious Masonic symbol of all. The Square and Compasses and the letter G in the center. The letter G itself is a spiral shape. It is the seventh letter of the alphabet, which holds a mystical significance in numerology. The letter G is the first letter of God, Geometry, and Genesis. The beginning of it all. This spiraling shape immediately draws the eye into the center of the Square and Compasses to the heart of Masonry. Geometry and the Grand Architect of the Universe. This is the heart of Freemasonry. The G is at the center of it all, and it is itself a doorway. A doorway to path to enlightenment. The letter G was added to the Square and Compasses symbol after the Craft had already been flourishing for a long time, but was one of the only major additions or changes that has been made to it since. The significance of the letter G is gone into in great detail in Paul Foster Case’s groundbreaking work The Masonic Letter G. This work is highly recommended if you would like to learn more. There is yet another spiral relation with the Square and Compasses that is not so obvious, but even more deeply symbolic and mind-boggling. Vortex mathematics is a relatively new type of mathematics and is still in it’s relative infancy. However, this form of mathematics may be the future of modern science. This mathematical formula describes a vortex that is known as a Torus. This donut shaped vortex is thought to be the shape of energy itself and may explain the true shape of the universe. In the Youtube video Randy Powell: Intro to Vortex Math. Randy discusses the concept of Vortex Math and shows in a 2 dimensional demonstration the way that this simple, yet perplexing system works. It uses a a small group of basic numbers (1 through 9) to show the relationships of the numbers and the way that they all effect one another. These multiples create doubling and a spiraling vortex that is the shape of energy itself. This concept was originally used in electronic coils to pass energy, but it has only recently been perfected numerically. These new coils could revolutionize all technology. The 2 dimensional version of the diagram shows lines connecting the numbers to one another. It doesn’t take long to realize what the shape is that is created by these lines. They form the exact shape of the two interlocking shapes that form the Square and Compasses. This shape, formed by two interlocking triangles symbolizes the convergence of heaven and earth which is the basic concept conveyed by all Western Esoteric systems. The Square and Compasses form a 2 dimensional representation of Genesis itself! Another important spiral symbol used in Masonry is the flight of winding stairs that are referred to during the Fellowcraft degree. These stairs are used to teach lessons about critical thinking, the liberal arts and sciences, orders of architecture and the 5 senses. This staircase is also representative of the journey of life and of learning. Each turn of the winding staircase reveals a view that was obscured before. What’s ahead is clearly a mystery and must be approached with discernment. This ascent up the stairs is also representative of the advancement of Masonic knowledge that the candidate gains on their journey to light. Spiral patterns are present in Masonic floor work as well. As the officers move about the lodge and traverse the room, the patterns they make are often in right-angled spirals. As the initiate is taken around the room during a degree, he makes circumambulations around the altar before he finally ends up in the center of the room at the altar. The pattern is representative of the Earth’s rotation around the sun and the process of passing time. It is also representative of a journey inward; a journey into ourselves. Cultures and civilizations the world over have depicted various spiral patterns in their art works and decor. They understood this esoteric concept of the universe being ruled by certain geometric patterns and shapes. Freemasonry is a perpetuation of these great secrets. Secrets that teach us the meaning of life and show us the patterns that tie everything together. The mysteries of Masonry are passed along to us now in their (mostly) unaltered form. They have been passed down since time immemorial to those who have eyes to see and ears to hear. We must take the journey inward, like that of the spiral and discover our destiny. On our journey to Masonic light, we must look at all of the details, or we may miss the bigger picture altogether. Vortex Mathematics-The Mathematical Description of Creation? Discovered by Marko Rodin, Vortex Mathematics describes the dynamics of the Torus. As we know, everything in nature moves in a toroidal motion. Everything from the galaxies to weather patterns move in a constant contraction and expansion motion. This toroidal vortex may be an even larger part of the whole that we currently realize. It may be a part of everything down to the atomic level or beyond. Vortex mathematics describes the dynamics of the torus in a way never done before. Researcher and mathematician, Randy Powell has taken Vortex Math to a new level. Incorporating a mathematical pattern that uses the basic aspects of numerology and Gematria, this system based on numbers 1 through 9 maps out the vortex. It is a simple process of doubling,which is also exactly the way that nature produces (i.e. dividing of cells-1 becomes 2, 2 becomes 4, etc.). It also incorporates reduction (i.e. 10 reduces to 1, 14 reduces to 5, etc.) Those familiar with esoteric traditions will certainly be familiar with this process of reduction. While searching for the mathematical depiction of the name of God, Randy found his answer in the Bahai faith. This discovery as well as working with Marko Rodin’s concepts led Powell to his new concepts in Vortex Mathematics. In the video links above, Powell goes into detail and describes how this math works and how it relates to Universe and to ancient mystical and mystery traditions. Hope you enjoy!